The college has several faculty members who are world-renowned in their area of expertise. 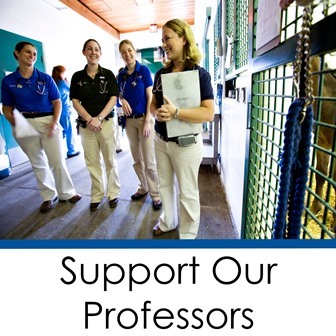 These faculty members deliver a wealth of knowledge to veterinary students in the classrooms and the clinics. Exemplified by world-class scholarship and instruction, endowed professorships and chairs are among the most significant awards conferred to faculty. Consider putting your name on knowledge with an endowed professorship. Interest earned from these endowed funds provides salary, research support and resources that enable educators to pursue projects at the forefront of their fields. Because they foster exceptional opportunities for teaching and research, endowed positions are fundamental to the college. Faculty support will make it possible to discover what we cannot imagine. More importantly, it will help our professors prepare future generations of veterinarians for the challenges of their own lives and times. Our talented and bright faculty with the proper tools will make life better for all of our animal friends. If you would like to put your name on knowledge by creating a professorship in your name, or to honor a faculty member or loved-one, please contact a member of our advancement team at 352-294-4256.